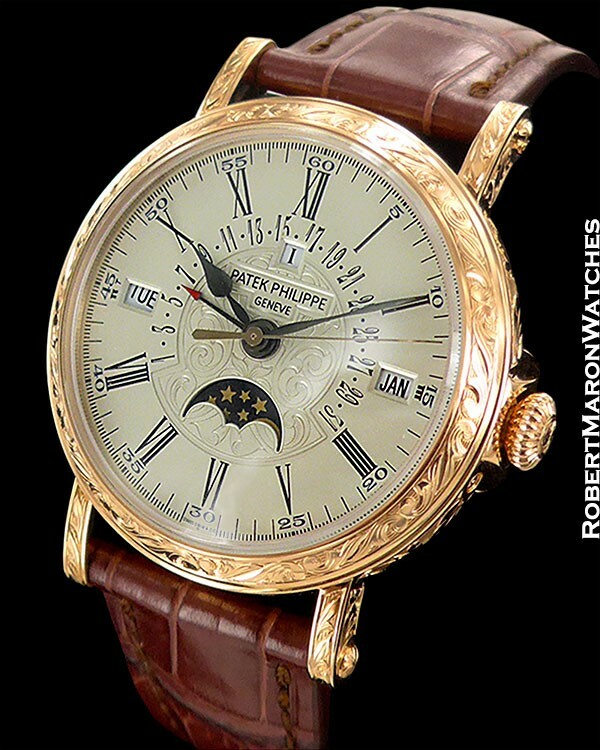 This reference 5160R is, visually, the nicest Patek Philippe wristwatch ever. The case is completely and extensively hand engraved, using patterns from vintage woodworking artisans, with a prominent Calatrava Cross in the center of the outside case back. The engraving is even on the deployment clasp. Art for the wrist. This watch is effectively the Patek Philippe reference 5159 with engraving. The 5159, in turn, draws its lineage to the reference 5050 perpetual calendar. 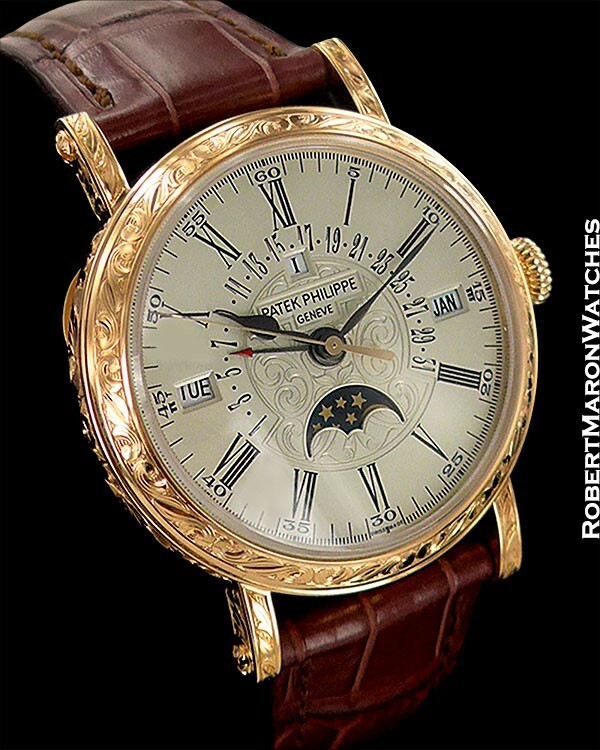 The 5050 was the first Patek Philippe pure perpetual calendar to break the $100,000 mark in the collectors’ market. The 5050 takes its cues from one of Patek’s all time great watches, the reference 5016 tourbillon perpetual calendar automatic, which like the 5050 has sweep seconds as does this 5160. The engraved case on the 5160 is its singular highlight without doubt. However, the watch is very interesting aesthetically in its timekeeping and date displays also. Its dial follows the same conventions as the 5016 and 5050. Namely, the dials of this trio all feature both classical elements, like the roman numerals, sword hands, and minutes chapter at the periphery of the opaline dial, and also playful elements like the retrograde date and the distribution of the day, month and leap year indicators. Significantly, these watches also have a center sweep seconds hand, which is a rarity. The Officer's case on the 5159 (also known as hunter-style) features a hinged caseback, which can be popped open with a flick of the thumb to reveal the sublime movement within. The hunter case is only offered on the 5159 and 5160 in Patek’s current model lineup. 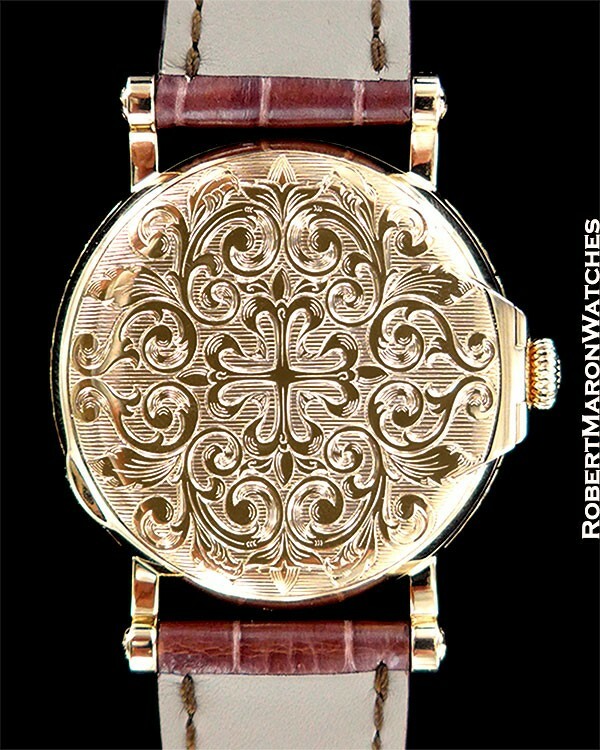 The extensively engraved officer’s case is 18k gold, with dimensions of 38mm diameter by 12.6mm thick. Constructed with 4 separate components, the sapphire display back is protected by a hinged solid case back. Slightly domed sapphire crystal in front, while display crystal is flat. Dial is solid 18k gold, opaline in color, with roman numerals for hours, arabic numerals for date and in the minutes chapter. Dial displays day, date via retrograde display, month, moonphase and leap year. Hands are blackened gold, spade style and offer excellent legibility. 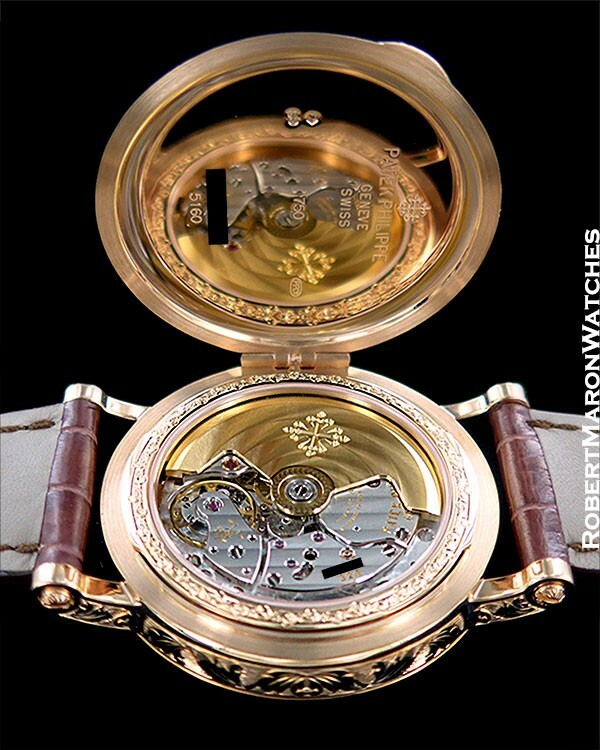 The engraving theme on the case is repeated, again by hand, in the center area of the dial. The caliber is the Patek Philippe Caliber 324 S QR with 30 jewels, 9 bridges, 361 individual parts and with a power reserve of up to 45 hours. 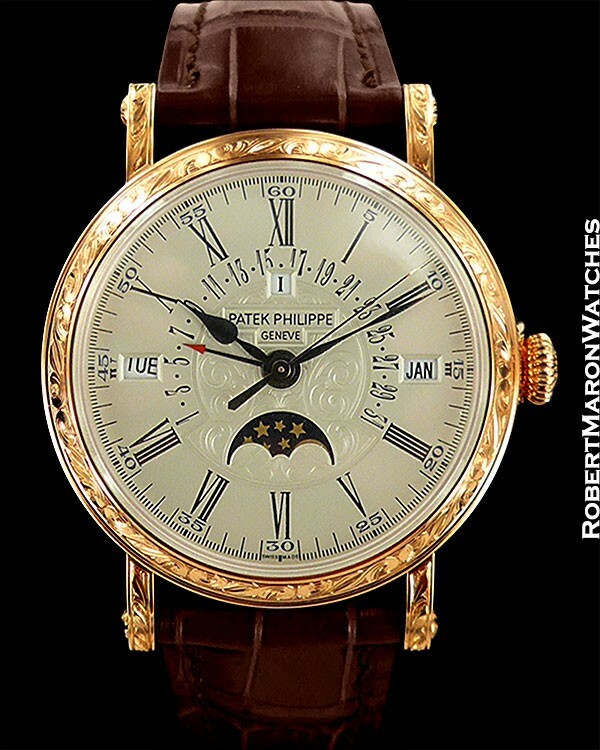 Movement is adjusted to heat, cold, isochronism and in 5 positions and bears the Patek Philippe Seal. 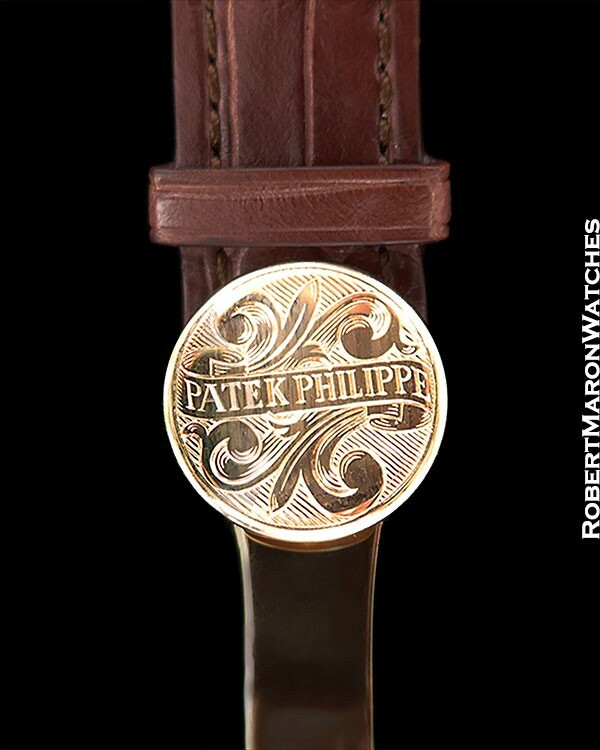 Strap is matte brown hand-sewn Patek crocodile with engraved Patek 18k deployant clasp.